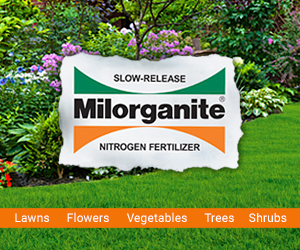 Although widely popularized in WWII Victory Gardens had their roots in WWI. Dr. Rose Hayden-Smith, a historian and nationally recognized expert on Victory Gardens and wartime food policies discusses the subtle differences. Initially called “Liberty Gardens” in WWI they were promoted at home, schools and at work as a way to secure the national food supply. Americans were encouraged to grow more fruits and vegetables locally as a way to reduce food miles so that trains could move troops and materials instead. Additionally this freed up agricultural products that could be shipped to our allies in Europe. This call to patriotism served to unify a diverse population under one goal of assuring allied victory. Just ten days after the bombing of Pearl Harbor the USDA convened a National War Garden Defense Conference to organize the WWII Victory Garden program, which became one of the most iconic wartime mobilization efforts in either war. 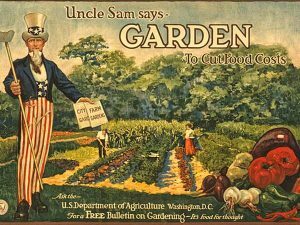 This time Americans were encouraged to garden more for unity and service to the nation as a morale booster for troops and those at home. Although the food supply was secure, this effort was about improving American health and lifestyle and reconnecting Americans to the land. That sentiment has never been more important today as we battle obesity, try to encourage a healthy lifestyle, engage the community and strive to protect the environment. Visible initiatives such as the White House Victory Garden and the People’s Garden at the Department of Agriculture seek to inspire those millions that pass by each year. Appointed as Secretary of Agriculture in 2009, Tom Vilsack wasted no time in implementing the People’s Garden as a commemoration of USDA founder Abraham Lincoln’s 200th birthday. 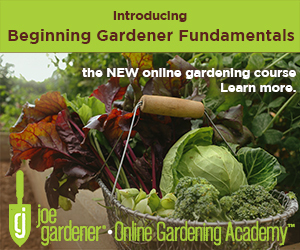 The 6,000 square foot organic garden replaces asphalt and includes 1,900 square feet of raised beds. 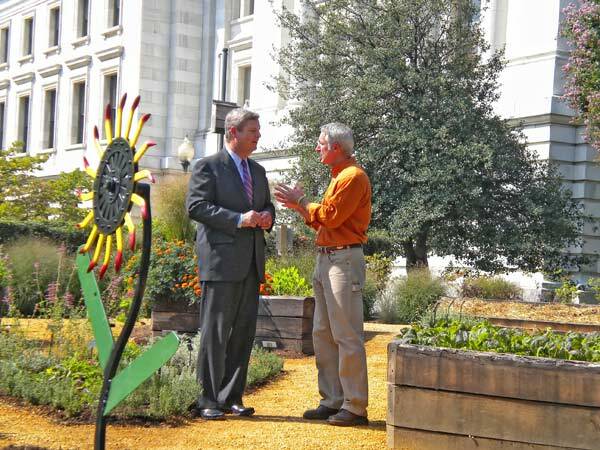 Joe and Secretary Vilsack discuss the mission of the garden. Leading by example, this initiative has grown globally to gardens in every state in the US, several territories, some foreign counties and embassies, many of which are in schools – 525 and counting. Encompassing food production, education and physical activity Secretary Vilsack hopes to inspire people to reconnect to their food supply and recognize the associated risks so farmers and ranchers are more appreciated for how difficult it is to raise food. As a large donor to D.C. Central Kitchen, the People’s Garden had so far contributed 60,000 lbs. of fresh produce. Patti gets a first-hand look into the world of this inspirational non-profit by Chief Development Officer, Brian McNair. 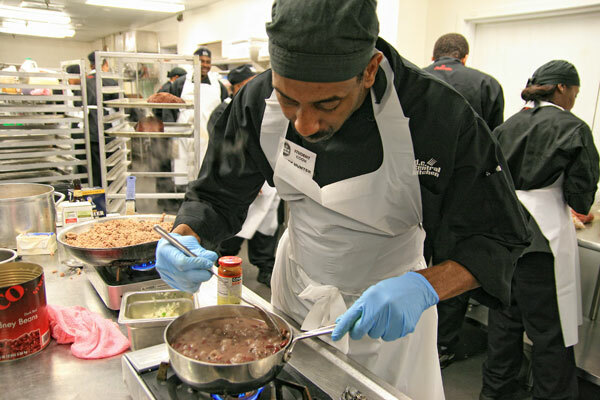 Besides providing 4,500 meals per day to at-risk individuals in shelters, halfway houses, and transitional homes, D.C. Central Kitchen offers nationally recognized culinary training and job placement for those clients they serve. 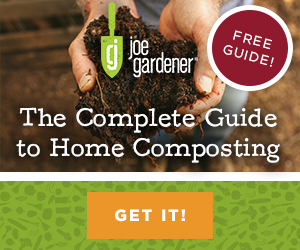 On an individual level many gardeners are embracing the concept of growing and sharing your own right at home. 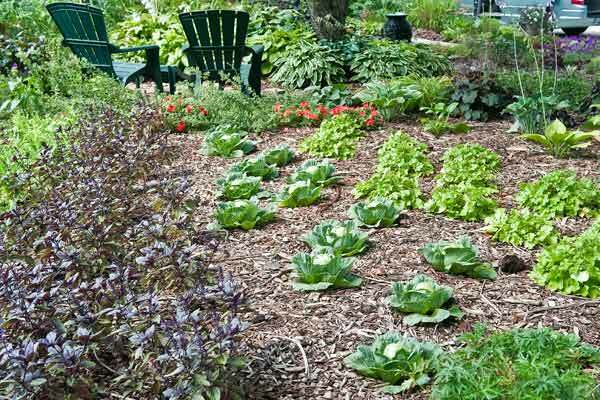 One such gardener in suburban Chicago is Shawna Coronado who mixes vegetables and ornamentals seamlessly in her front yard garden. Saddened that a neighbor could not afford to feed her family and subsequently lost her home, Shawna decided to inspire others to make a difference and contribute produce to feed the hungry. Gardening organically with sustainability in mind, her small garden provides enough fresh produce not only to feed her family but to donate to local food pantries as well. 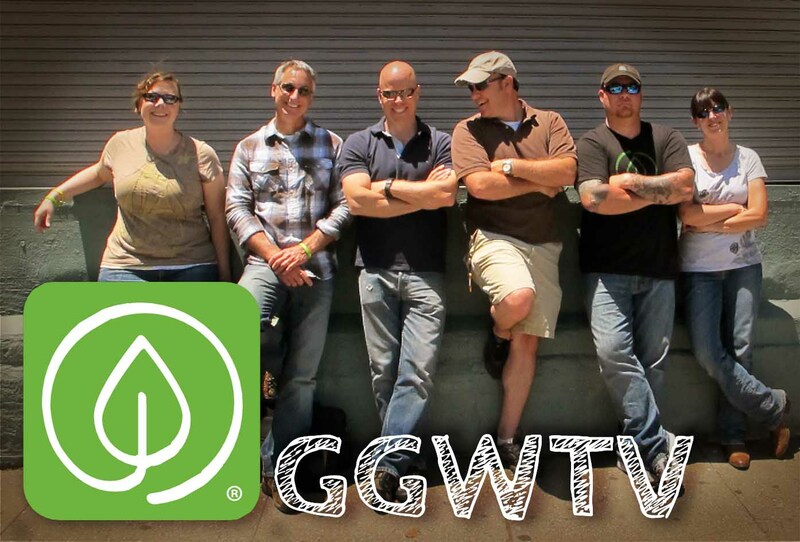 Join Joe as he and Shawna discuss some of the special features incorporated into her garden. One of Joe’s favorite edibles to bring a colorful pop to your garden and to your plate is Swiss chard. Chef Nathan takes heed and prepares a tasty frittata for breakfast. in loveeeeeeeee!!!!!!! haven’t watched it but still love it. Very kind of you Dave. Thanks for taking the time to share your good words here. And we hope you’re right about our series going on for years too! We certainly plan on it working out that way. This is my favorite episode, loved seeing the home garden done organically and shared with community. Great video! I garden in the Fenway Victory Gardens (Boston, MA) and noticed a few photos in the video that looked quite familiar – that was nice to see! 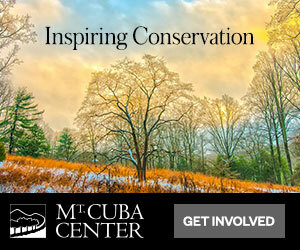 We would welcome you coming to our neck of the woods for a full visit…please give it some thought. 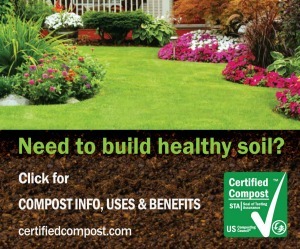 I forgot to mention that my garden is on http://www.YourGardenShow.com (http://www.yourgardenshow.com/users/Kristen/boston-fenway-victory-garden)…this is a social network for gardeners by gardeners (with all sorts of cool online tools) – victory gardeners and all other types of gardeners are welcome! Thanks for the update Joe. I made some calls and am keeping my fingers crossed. 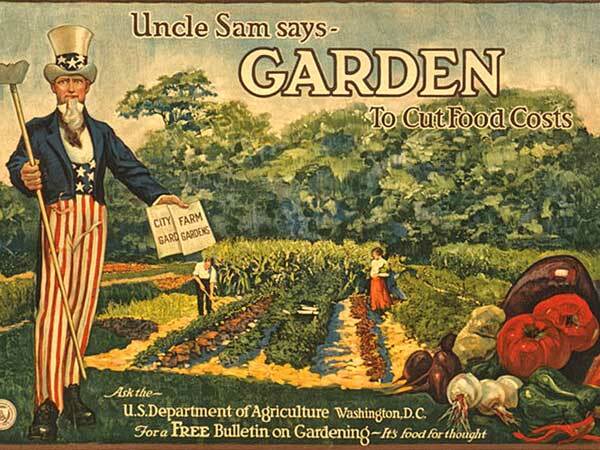 During the first and second World Wars, Americans were encouraged to plant Victory Gardens. Today the United States Congress is considering passing legislation that will restrict your right to grow your own food! SB 510 is real and we should all be aware of this legislation. Call and ask your representative if they know what this bill is really all about and how it will affect you? Do a search on the net and read the legislation and then make some calls and spread the word. Just found this site, and I am so inspired! I have grown some of our veggies (out of a love for it for years) and want to do so much more! I recently began college for the first time at age 40, as a single mom, and my course of study is- what else? Agronomy! I look forward to learning anything and everything any source has to teach me! Good for you Linda! Now I’m inspired by your motivation to take on college at 40 and a single mom. That is awesome! I’m glad you found us and hope you will continue to look to us as a source of continued learning and inspiration. Keep us posted on your progress. Just don’t ask us for help on your agronomy tests! Thanks all for nice comments. I love hearing that you enjoyed this and every episode that you comment on. It’s hard to believe that this was the last of the season but take comfort in knowing more are coming and the work has already begun. One of THE best episodes yet! Loved it, Joe. Great work as usual. A good history lesson and inspiration for the future. I love my backyard (and side, and front) gardens. You should see my seed collection. I loved the footage of the gardens and happy to hear about all of the local food donations. imagine if everyone shared their excess. I agree with Shawna: Food isn’t just for the backyard; it should be one of the best features of a home and displayed (and eaten) for all to enjoy. Man Shannon. You must have a big “S” under all your clothes. I don’t know how you manage to keep up with us in addition to the many other aspects of life! But we sure do appreciate you so much and love hearing what you have to say next! Another great episode, Joe. i thought I understood Victory Gardens but I learned a lot about their history from this episode. It made me even happier that I have begun my own. 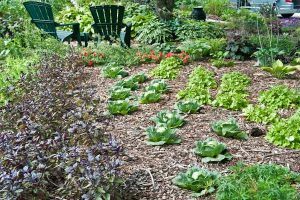 And the interview with Shawna Coronado just adds support for the argument to grow food in the front yard rather than lawn. I have enjoyed watching Shawna on Youtube for a while now, so it was nice to see her garden in even more detail on your show. Thanks Steve. I’m with you. Having such a great expert as Rose Hayden-Smith really fills in the gaps that I think a lot of us had when it came to understanding the history of Victory Gardens. So glad you liked the show and thank you for your comment. Planting a victory garden is one of the easiest ways to reduce your carbon footprint and provide your family with nutritious food (year round if your store it). It’s really a lot easier than people think, and the enjoyment it brings is priceless. You can learn more about my victory garden on my blog http://thegivinggarden.wordpress.com/ or website http://www.thegivinggarden.com. Otherwise Happy Gardening to Everyone and start ordering your seeds for next year now! 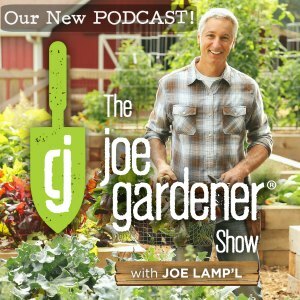 Wonderful episode into the world and history of the Liberty/Victory gardens of yester year and were we are growing today in gardens across the country! “the old folks” talking about having one.